After 2 years of gathering stakeholder input and reaching industry and academic consensus, production of the SMART Wind Roadmap is now complete. 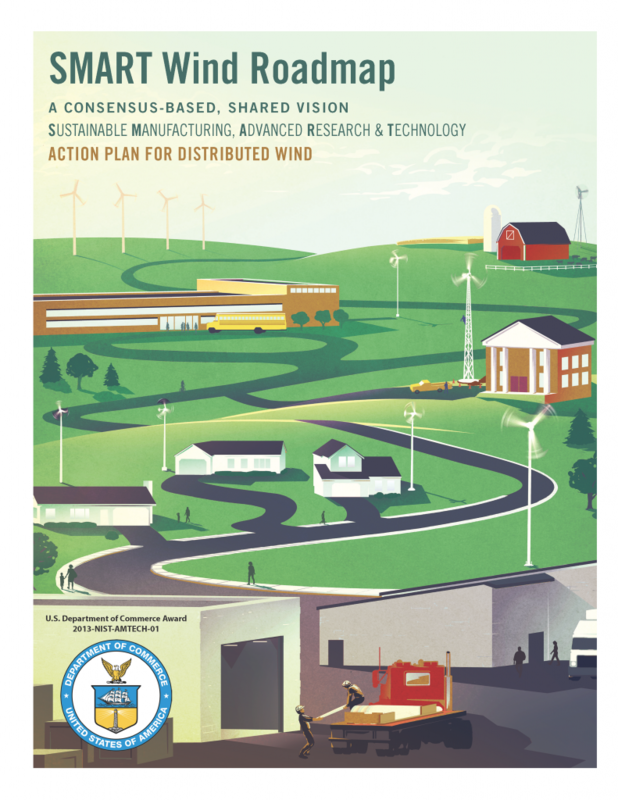 Funded by a grant from the U.S. Department of Commerce’s National Institute of Standards and Technology (NIST) Advanced Manufacturing Technology Consortia program, the Distributed Wind Energy Association (DWEA) convened the SMART Wind Consortium to identify industry-wide research and manufacturing gaps and barriers, prioritize solutions to those gaps for today and for future scalability, and facilitate a rapid transfer of innovation into American-manufactured wind turbines. The SMART Wind Consortium has linked together more than 2 dozen distributed wind energy equipment manufacturers, 50 other vendors and industry supply chain members, researchers from 4 federal laboratories, 30 academic stakeholders, and nearly 20 nonprofit organizations, government representatives and other stakeholders. This initiative will open up new market opportunities and expand the number of distributed wind applications, thereby maintaining U.S. global competitiveness and leadership. The project’s vision is to inspire joint industry-academic R&D investments to advance innovative manufacturing techniques and aid rapid distributed wind growth both domestically and with exports. As both developing and industrialized nations seek to address climate and economic challenges, the U.S. distributed wind industry stands poised to provide cost-effective solutions and claim its share of the multi-trillion dollar global microgrid boom.